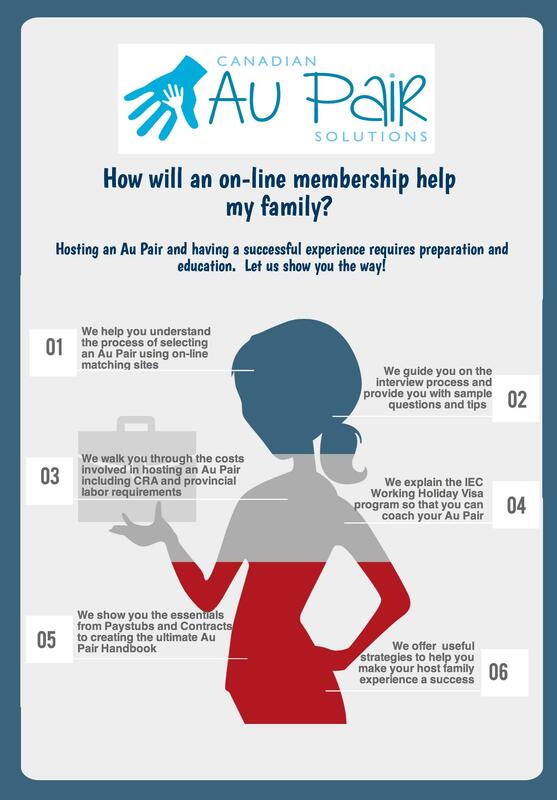 What is Canadian Au Pair Solutions all about? At Canadian Au Pair Solutions, we are busy full-time working Moms who understand the stress of finding affordable and quality care for our children. We are convinced that an Au Pair is a great option for Canadian families seeking help with childcare. We think an Au Pair is the answer to the full-time childcare crunch and also the before and after-school care dilemma. Choosing to host an Au Pair will not only solve your childcare stresses but also add enrichment and culture to your home. The new relationships you will build with your Au Pairs will be the most rewarding part of your decision to host an Au Pair. With over 10 years combined experience interviewing and selecting childcare for our own families, we are passionate about sharing our knowledge and experiences with you. Agencies advertising Nannies and Au Pairs can charge between $1000-$3000 to assist you in your search for appropriate childcare. Although they help you narrow your search, you still are part of the interviewing and selection process and most often will be an active participant. Agencies also charge extra fees for assisting with payroll, business registration and other requirements of hiring live-in care. See our infographic for a comparison between our services and those agencies provide. We are not an Agency and we will not find you an Au Pair. What we do, and what we excel at is providing you all the training and tools you need to find an Au Pair yourself while saving you expensive Agency fees. We will provide you with a service that will give you the most up-to-date information on how to find an Au Pair, how to select an Au Pair and how to host an Au Pair. We will guide you through the process of becoming an employer, explain the remittance requirements with Revenue Canada and we will offer you sample Au Pair contracts and payroll documents. We can also provide you with on-going support by way of email if required. This is just a short description of how we can help you. Refer to our Toolbox and Membership pages for more details. Although not a complicated process, finding an Au Pair can be a stressful process. There are things that every family must be aware of when hosting an Au Pair. 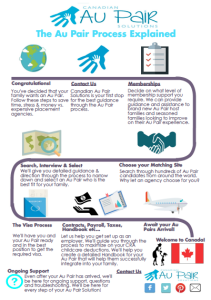 By following our advice, you will be confident that you are doing everything legally and “by the book.” We’ve heard countless stories of Au Pairs who come to Canada without Visas who are turned away at the border leaving families in very stressful situations without childcare. Your Au Pair will not be turned around at the border if she has a proper work permit (IEC Working Holiday Visa) and will legally be able to work with your family. We can walk you through this process. Some families have been given the misinformation that Au Pairs don’t get ‘paid’ like traditional childcare providers do. This is simply false. We’ll walk you through the steps on how to pay your Au Pair properly which in turn will allow you to claim the maximum benefits on your tax return. 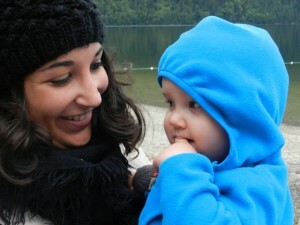 You will have an arsenal of knowledge for choosing the Au Pair best suited for your family. We will teach you how to conduct proper background checks, conduct thorough Skype interviews and create Au Pair employment contracts. We’ll give you all you need to do this right! You need us because we can save you time and money. It took us years to compile the information contained on our website. If you choose to go it alone, you will spend countless hours on the internet trying to answer your questions and then you may worry about the uncertainly of the answers you’ve found. Let us save you time and worry. We are committed to being a one-stop shop for everything you need to know about hiring an Au Pair in Canada. You will no longer need to scour the internet for answers or post multiple questions in various Facebook groups and blogs, hoping someone will know the answer to your questions. We’ve been there. For many years we asked the same questions you are asking, except now we have the answers. We also promise that if you cannot find the answer to your question on our website, then we will put all our efforts into getting you the answer quickly. We are passionate about the Au Pair childcare option and we will provide you with all the information you need to welcome an Au Pair into your family. fits into the process of hosting an Au Pair. Thank you for visiting our website and please feel free to contact us if your questions are not answered on our site.